1-04 What Have I Done To Deserve This? 2-05 Can You Forgive Her? Phonographic Copyright (p) – Pet Shop Boys Partnership Ltd. Copyright (c) – Pet Shop Boys Partnership Ltd.
℗ 2003. The copyright in this sound recording is owned by PSBP Ltd under exclusive licence to EMI Records Ltd. © 2003 PSBP Ltd under exclusiv licence to EMI Records Ltd. Some copies are known to include discs printed with Promo only. 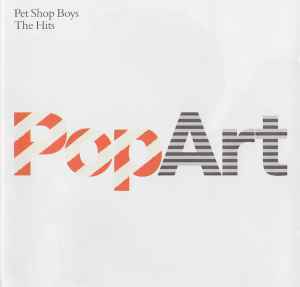 Not for resale: PopArt (The Hits). Please make sure that you've read and understood the Discogs Sales & Transaction Policy and seller's terms (these terms & conditions) before pressing the PLACE ORDER button. Standard CD and CD-single cases are not graded. Cases may have wear, but are not cracked when shipped unless stated otherwise. See item description. Do not pay until you've received an invoice. If you want to add additional items to your order, don't pay the received invoice, but order the additional items and wait for an updated invoice. Accepted payment method is PayPal. Bank transfers are accepted for orders from Euro countries as well. Please pay within 5 days. Include the Discogs order number with your payment as a reference. No payment without a valid reason will result in a "non-paying buyer" cancellation of your order, which automatically results in negative feedback on your account. All orders will be shipped to the shipping address registered on your PayPal account. No exceptions will be made. Please make sure the shipping address on your PayPal account is correct before paying. All orders will be shipped in strong protective material to minimize the risk of damage during transportation. Orders >25 Euro are sent registered. Registered mail is always required for certain regions. See below "SHIPPING AND HANDLING COSTS" for details. Priority parcels are usually dispatched within 2 working days. Registered parcels are usually shipped twice a week. You will receive a dispatch indication with your order confirmation. International shipping generally takes up to 2-4 weeks. However, in extreme cases it can take up to 12 weeks as parcels may be delayed by customs or local postal services. Although I do everything to prevent these kinds of delays, there's nothing I can do about it if it happens. Parcels will be considered "lost" if they haven't arrived after 12 weeks, not earlier. If you need your order before a certain date, please contact me first. Shipping & handling fees consist of the postage costs, and the applicable Discogs and PayPal fees. Below you can find an overview of the costs for the most common types of orders. Double CD boxes count as two separate CDs in a regular jewel case, triple CD boxes as three CDs etc. Due to recent changes in policies of several postal services shipping costs for registered parcels will change. For now, please contact me for a quote for registered shipping. 1: € 6,75 | >1: registered shipping only, see "Rest Of The World"
You are buying from a private party in the Netherlands, not from a company. In line with Dutch law, which is applicable on any transaction with me, returns are not accepted. All items are checked before shipping to verify the item description and grading. If the item in stock doesn't exactly match the item listed on Discogs, I will contact you before shipping. If you are unsure whether you really want the item you are about to order, please don't place the order. As soon as your order is shipped, the transaction is final and cannot be cancelled or reverted. Brand new and unplayed. Now deleted EU "Copy Controlled" version. Comes in a jewel case. Check my other items for more Pet Shop Boys items.